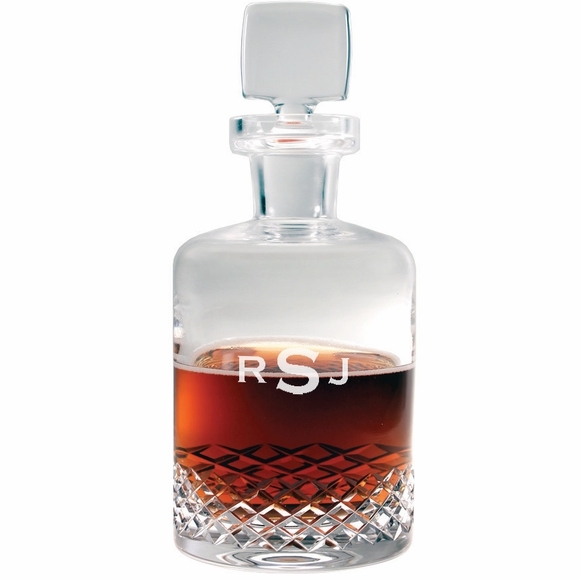 Monogrammed Diamond Cut Whiskey Decanter - - a must-have bar accessory personalized with a bold block print monogram (up to three letters). Made in USA. Sophisticated diamond cut glass 26 ounce decanter. Monogram letters are placed in the exact order in which you enter them. For a traditional monogram enter letters in this order: First Last Middle. The middle letter will be the larger letter. Personalized barware always makes a welcomed gift. Designed, made, and engraved by skilled glass workers in the USA.